Seated before a raucous, city-hall crowd of 400 that didn’t always obey rules limiting the debate, city councilors last night voted down two resolutions opposing plans to base the F-35s at Burlington International Airport. The first resolution, calling for the city to actively oppose locating F-35s at the Burlington-owned airport, was rejected 10-4. Councilors Max Tracy (P-Ward 2), Kevin Worden (D-Ward 1), Vince Brennan (P-Ward 3) and Rachel Siegel (P-Ward 3) voted for the resolution. The council seemed swayed by an opinion issued in recent days by City Attorney Eileen Blackwood, who said Burlington does not have the legal right to ban the military from using any specific aircraft, and could be held financially liable for violating leases with the federal government if it tried to restrict the Air National Guard’s operations. “There is no way I am willing to put the city at risk for that liability,” said Councilor William “Chip” Mason (D-Ward 5). The second resolution, which would have banned planes that are louder than 65 decibels or have crash rates higher those of the F-16 — standards the F-35 is expected to exceed — was rejected 11-3. Brennan, Tracy and Siegel voted in support. BTV Aviation Director Gene Richards told the council the anti-noise resolution could jeopardize future efforts to lure other commercial airlines to the airport. Concern for the future of BTV swayed Councilor Karen Paul (I-Ward 6) to vote against both resolutions. Councilor Tom Ayres (D-Ward 7) said he was “appalled” by the F-35 and believed the next-generation fighter should be sent to the “scrapheap.” But he said he did not believe the council had the authority to make decisions about whether or not to host them — and voted against both resolutions. The Air Force prefers to station an F-35 squadron with the Vermont Air National Guard in Burlington, instead of alternative locations in Florida and South Carolina. The final decision is expected later this year. If it’s affirmative, the jets would arrive in six to eight years, around the time when the Air Force is scheduled to phase out the F-16s currently stationed at the city-owned airport. During nearly four hours of debate last night, little new ground was broken, as speakers from both camps reiterated arguments that have been typed, published, whispered and shouted for months: The planes would bring jobs. They would be too noisy. The community should support the troops. The community should reject the latest expansion of the military-industrial complex. UVM student John Godfried said he hears F-16 roar overhead once a day, and he told the council he’s against the federal government spending money on fighter jets instead of social programs. Others rejected the argument that basing the F-35 would aid the local economy, insisting the city should not rely on the military for jobs. Supporters said the arrival of the F-35 would not represent a significant change from the F-16 and would help keep the local economy vital and the country safe. Juan Coleman, a North Carolina native, said he graduated from Norwich University in 2006 and returned to Vermont in 2008 to join the Vermont National Guard. He said he was concerned that losing the F-35 would jeopardize the guard’s future. Vermont’s entire congressional delegation, along with Gov. 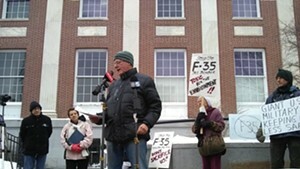 Peter Shumlin and Burlington Mayor Miro Weinberger, supports locating the F-35s in Burlington. Long before the meeting began, the loud, persistent cheers of the anti-F-35 crowd, who were gathered mostly in the balcony, filled Burlington City Hall Auditorium. Meanwhile, F-35 supporters, many of them wearing “F-35 for Vermont” T-shirts, sat quietly on the main floor below. Council President Joan Shannon (D-Ward 5) — who last week circulated detailed rules about who would be allowed to speak, and for how long — urged the crowd to act civilly and limit their comments to two minutes. “It’s not civil discourse, you’re taking up the time of your neighbors,” Shannon said, her voice rising. As Dunbebin began to protest, Shannon slammed the gavel. “Not another word,” the council president yelled. Dunbebin kept playing the recording and held aloft a sign that read, “Only six minutes a day,” a reference to the amount of time residents living near BTV would hear the jets. “Shut him down,” members of the crowd shouted. Others clapped for him. “There’s no clapping,’ Shannon yelled. Aside from a few unauthorized bouts of clapping and speaking out of turn, mostly from the anti F-35 crowd, much of the night continued civilly. A (very) unofficial Seven Days tally registered 37 speakers in support of the F-35 basing, 36 opposed, one who forfeited her allotted time to speak for reasons that were not clear, and one whose opinion was unclear after he spoke for two minutes. By the end of the night, it seemed as if every plausible argument had been made, several times, for and against the plane. Councilors said they have been bombarded by opinions for months. Indeed, one speaker said she tried in recent weeks to call or leave messages for every councilor in the room, but found many of their voice mailboxes were full. * This post originally made it sound as though F-35 opponent Doug Dunbebin used his two-minute speaking opportunity to play a recording of the noise generated by the fighter plane.